Supported by the Campaign for the Public University (CPU), the University and Colleges Union (UCU), the British Sociological Association, the British Universities Industrial Relations Association, London Region UCU, and the following UCU branches: Dundee, Imperial, Liverpool, Newcastle and UCL. The Convention will be structured around the stated premises of the Green Paper in order to coordinate a collective collegiate response to it. Sessions are intended to be both informative and participatory. 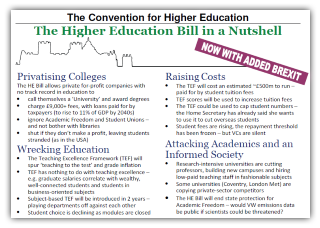 The Convention and this website is coordinated by members of CPU and UCU. 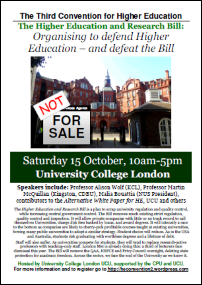 The Convention is open to everyone who cares about the future of the Public University and the threat the Green Paper represents to academic freedom. Following the Convention, the Organising Committee intend to use the website to act as a point of dissemination for material, help colleagues identify speakers for local meetings, etc. We want to facilitate members of the UK academic community to raise these issues in their institutions and wider public communities, and with politicians and the press. The official government consultation on the Green Paper closed on 15 January. The Convention takes place five weeks after, ahead of the publication of the White Paper. In order to facilitate debate we are posting academic responses to aspects of the Green Paper from colleagues across the sector on our website. We expect a Government White Paper to be published in May and a Higher Education Bill in the next Parliament. It is time to get organised.